How good is the computer in NHL ’94? Like all good Americans, I still own a Super Nintendo with a working version of one of the greatest sports games of all time (greatest hockey game, certainly): NHL ’94. My roommates and I would stay up late, completely engrossed in our battles. The games usually finished with the loser cussing out digital versions of Ulf Samuelsson or Paul Coffey for skating the wrong way. 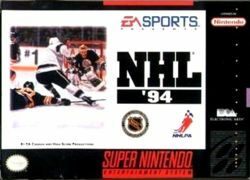 Well, we recently went our separate ways, and I’ve been left to play NHL ’94 alone. I may sound like a loser, but…. well, I am. After destroying the East All Stars (played by the computer) with the Florida Panthers (the 1994 Panthers, mind you), I thought that the computer may not be very good at this game. So I performed a small experiment. I set my team as Florida, and the computer as the East All Stars. However, this time, I did not touch the controller. If my player got the puck, he stood there until someone hit him or took it. I merely hit start to begin each period. Some called me crazy. Some will call me a genius. Jagr scored for the East on a one-timer with about 2 minutes left in the game. The All Stars had one breakaway, which they missed. The All Stars won the body check statistic 43 to 5. Florida actually won the faceoff battle 13 to 12 (???). No, really. Each team got a penalty, though the one on Florida was a bullcrap holding call. Mario put Joe Cirella out for the game with his roughing penalty. Who is Cirella, you ask? Someone out there has probably bought a car, a house or insurance from him. So this pretty much proves that any of those “practices” I had playing the computer were worthless. I debated picking up the controller with a minute left in game, but that would have ruined objectivity of this highly scientific experiment. I guess I’ll just have to go back to NBA Jam T.E. This entry was posted on August 31, 2007 at 1:45 am and is filed under He's on fire, NBA Jam T.E., NHL 94, Ulf Samuelsson. You can follow any responses to this entry through the RSS 2.0 feed. You can leave a response, or trackback from your own site.